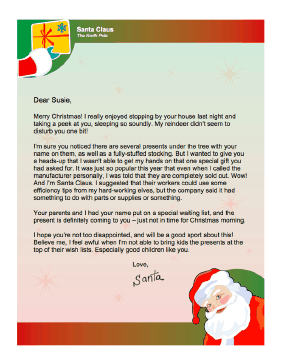 This printable letter from Santa Claus lets a child know that one of his or her gifts will be late. Merry Christmas! I really enjoyed stopping by your house last night and taking a peek at you, sleeping so soundly. My reindeer didn't seem to disturb you one bit! I'm sure you noticed there are several presents under the tree with your name on them, as well as a fully-stuffed stocking. But I wanted to give you a heads-up that I wasn't able to get my hands on that one special gift you had asked for. It was just so popular this year that even when I called the manufacturer personally, I was told that they are completely sold out. Wow! And I'm Santa Claus. I suggested that their workers could use some efficiency tips from my hard-working elves, but the company said it had something to do with parts or supplies or something. Your parents and I had your name put on a special waiting list, and the present is definitely coming to you - just not in time for Christmas morning. I hope you're not too disappointed, and will be a good sport about this! Believe me, I feel awful when I'm not able to bring kids the presents at the top of their wish lists. Especially good children like you.